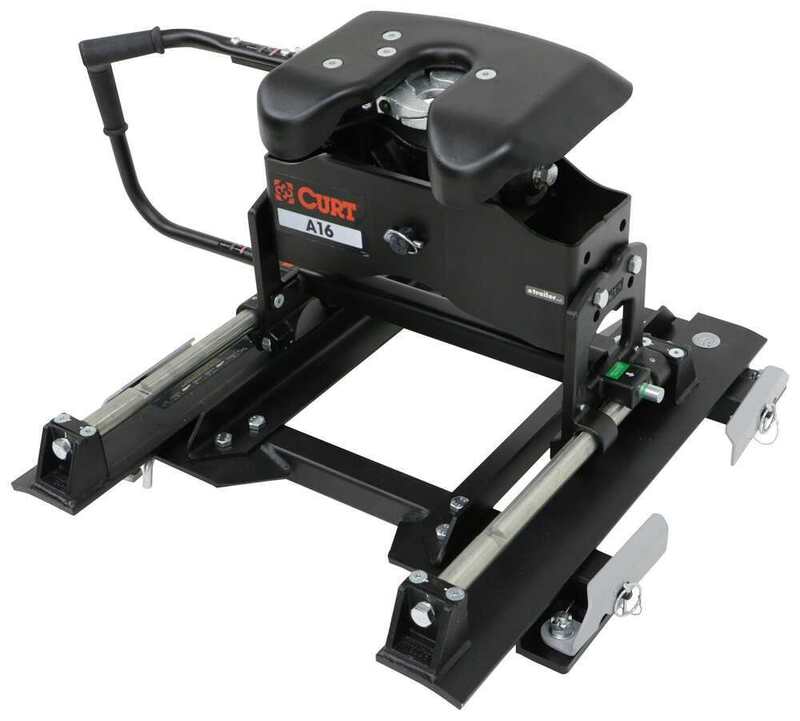 Heavy-duty 5th-wheel hitch has interlocking jaws, a torsion head, and a color-coded lock indicator for security. Non-binding slider ensures proper clearance during slow turns. Includes adapter rails for Chevy/GMC 5th-wheel towing prep package. Call 800-298-8924 to order Curt fifth wheel part number C16668 or order online at etrailer.com. Free expert support on all Curt products. 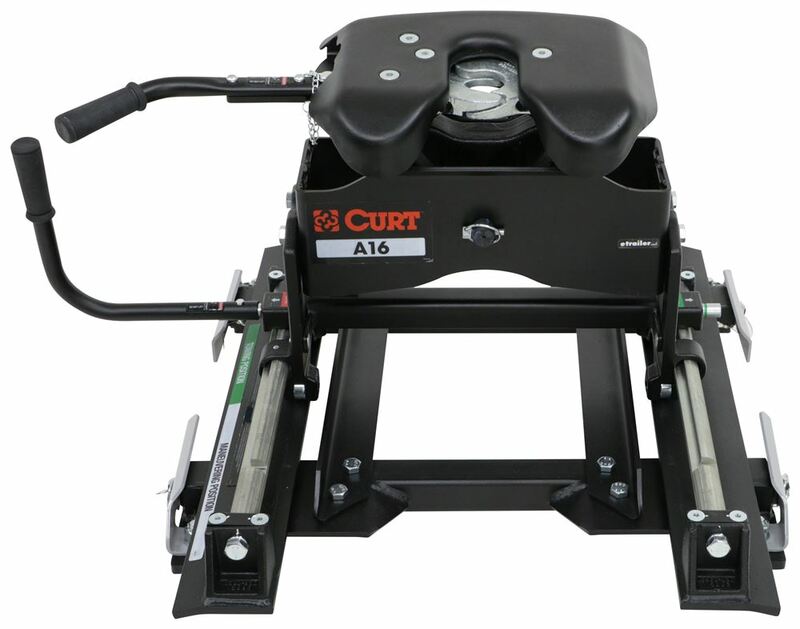 Guaranteed Lowest Price and Fastest Shipping for Curt A16 5th Wheel Trailer Hitch w/ R16 Roller for Chevy/GMC Towing Prep Package - Dual Jaw - 16K. Fifth Wheel reviews from real customers. Hitch height: 18-3/4" - 22-3/4"
Most often used on trucks with 6' and 6-1/2' beds, this roller helps to eliminate clearance problems during slow-speed turns. When you are towing a fifth-wheel trailer, your hitch must be situated on the cab side of your truck's rear axle. However, at slow speeds you can use a roller to slide the fifth-wheel hitch (and the trailer) toward your truck's tailgate and past the rear axle, creating enough space between the cab of your truck and the trailer to permit less-restricted turning. The round-tube design of this slider allows for relatively uninhibited movement of your fifth-wheel hitch. Because your hitch can glide smoothly and easily along the rods, there is less chance of binding. With straight, flat contact points, as found with square-tube sliders, tension can build between the slider and the hitch when your truck and trailer are somewhat out of line or are on uneven ground. As a result, it can be difficult to properly activate the slider when your truck and trailer are not in a straight line. With a round-tube slider, there is more give between the contacting surfaces, allowing better mobility of the hitch system. Fewer corners means less tension buildup. Activating a round-tube slider is easier, and operation as a whole is smoother. 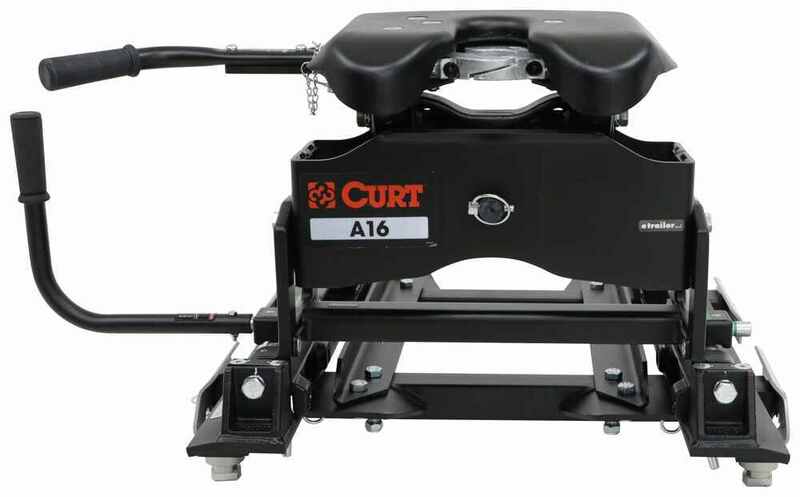 Curt rebranded this fifth-wheel trailer hitch by changing its name from Q16 to A16 in 2016. All features and specifications remained the same. 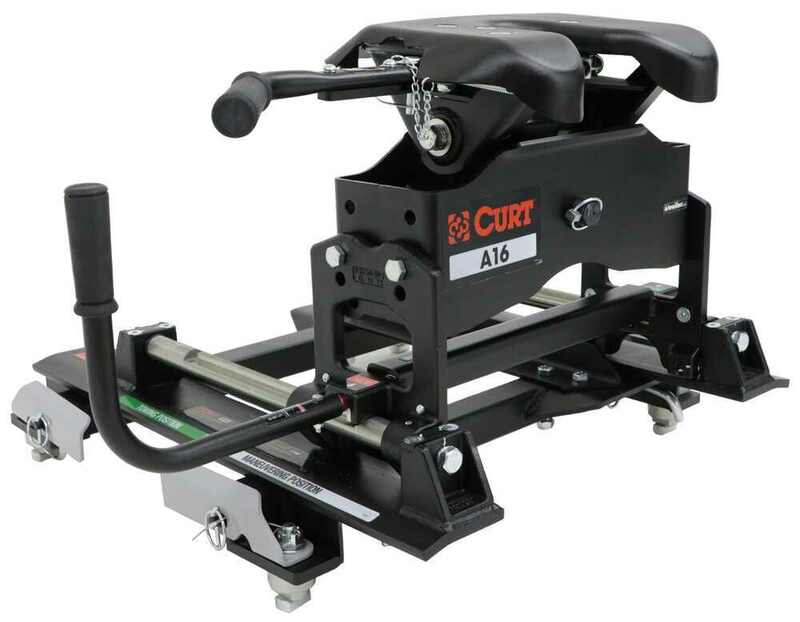 Speaker 1: Today we're going to take a look at the Curt A16 5th Wheel Trailer Hitch, with the R16 Slider for the Chevy/GMC Towing Prep Package. It has a 16,000 pound weight capacity. Now, this is a custom-fit part. It is designed to fit the 2016 and newer Chevrolet Silverado and GMC Sierra 2,500 and 3,500 trucks, with the 6-1/2' bed and the factory rail kit. 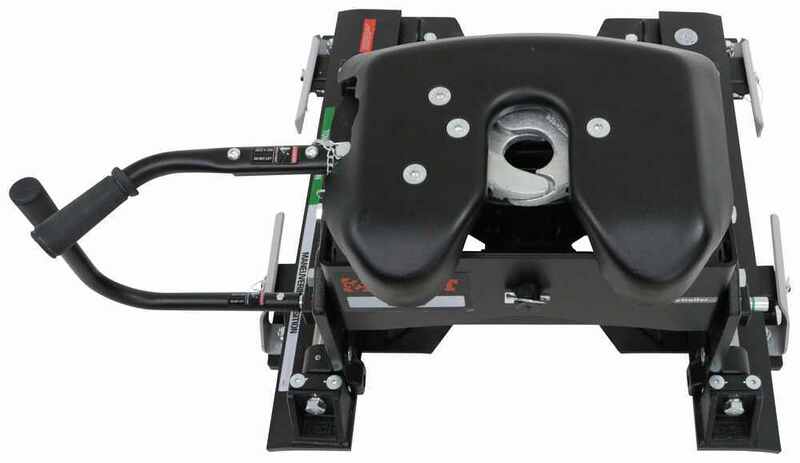 On a custom-fit product I always like to recommend for you to go to our website, use our fit guide, put in your year and model vehicle, and it'll show if this will work for your application.Now, this 5th wheel hitch will mount in your truck bed, so that you can tow your 5th wheel trailer. This one's mounted on this non-binding slider, which will provide a clearance required for your sharp bed truck to turn safely at slow speeds. The slider travel will give you 12" front to back.Now, that extra clearance will prevent your trailer from hitting the cab of your truck during sharp, slow speed turns. It'll slide smoothly on these rounded, non-binding rods. This is designed for use on trucks with beds shorter than 8', but not recommended for use on truck beds shorter than 6'.Does use this two jaw interlocking system, right up here. Provides a nice 360 degree jaw to kingpin contact. Because of that, it'll give you less rattle, more security than the slide bar models. Does offer two lube points, right in the front here. Makes it easy to access grease Zerk fittings, one right over here, one right over here, one on each jaw. It allows you to put your grease gun right on there and lubricate the jaws.The head on this is a fully articulating torsion head. Gives you controlled coupling and a nice stable, quiet ride. It will self-align for easy hookup, suppresses any road shock, and it will reduce bothersome towing noise.Now this does offer a fast one-pin head removal, to make it easy for one person remove the hitch from the vehicle. Right here, this clip, if you move this clip and slide out this large pivot pin from the back here, slide that out, you can take the head out of the crossmember and then take your crossmember right out of the slider. Makes it easy for one person to break it down.Now this does offer a 4" hitch height adjustment. Now hitch height is critical, 'cause when you go to two your 5th wheel, you want it to be as level as possible with your tow vehicle. So, when you go to mount this crossmember to the slider, there is different rows of holes that'll give a 4" hitch height adjustment. Now hitch height is always measured from the truck bed to the top of the hitch head, so it'll let you adjust it from 18-3/4, all the way up to 22-3/4.Other nice feature on this, they offer a 3 point color-coded indicator system, right back here, under the hitch head. What's nice about that, it'll tell you if your hitch is ready to couple, uncouple or tow, by using your color-coded system. What's nice is you can see those colors from the cab. So, if you're sitting in the cab right here, you can turn around and look. Whatever color is showing there, it'll tell you what position the jaws are in.Right now, it's showing a green circle. Green means it's ready to go. You're ready to tow. You're all set. Now, if we'd open that and the jaws pop open, it would show a yellow triangle, which means you're ready to couple. By chance, if it shows the red octagon, like a stop sign, that means you're uncoupled. You're not ready to couple up yet. Right now, as I mentioned, it's showing a green circle, so it shows the jaws are closed. You're ready to go.The handle itself is a lockable handle. Let's you easily secure the trailer to hitch. Comes with this pin and clip that's tethered to this lanyard, so you don't lose it. The hole is large enough, you could put a padlock through there if you want extra security. The padlocks, we do sell separately on our website. The handle is a nice short throw single handle operation. I'm going to show you in a few minutes how that works, give a demonstration on all of its features. Then put the pin and clip back in.Now it does come with this plastic lube plate. This plastic lube plate will go on to your kingpin, so when you go to hook up, it helps the kingpin glide smoothly into the hitch, during hookup, and it puts a little of the plastic here between, so you don't have metal to metal contact. In other words, your 5th wheel will sit on this lube plate.Now to install this into your vehicle, it's very fast, easy installation. Basically, it'll just drop into the four receiver pucks that are built into your factory under bed rails. All you have to do is, right here you got a clip. Just remove the clip, rotate this handle 90 degrees, and it'll rotate the tab. You'll do that on each corner. Once they're all four opened, you just drop it into those four pucks that are in the factory under bed rails. Once it drops it, rotate the handles back. Again, you'll do it on each corner. That'll twist that tab and lock it into place. Then just put the clip back through there, to hold the handle into place. So it's very simple installation and easy to remove also.This hitch is a sturdy steel construction. Has a nice, durable carbide power coat finish to it. Few specs on it again, the application is for the 2016 and newer Chevy GMC trucks, with the factory installing towing prep package. Gross towing weight capacity is 16,000 pounds. Vertical load limit or pin weight capacity is 4,000 pounds. 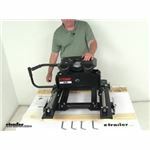 And we mentioned the slider travels is going to give you 12" front to back.So what we're going to do now is, I'm going to demonstrate the jaws, how they operate and the slider, how it'll operate. I have here an example of kingpin, what it would look like on your 5th wheel. When we go to hook up, just again, take the pin and clip, unhook it, pull it out and then you'll see this handle we talked about, very sharp throw, pop it back, jaws pop open, you're ready to hook up. As we mentioned, if you look back here at the color coated system, it's showing a yellow triangle. So it means you're ready to couple. When you go to couple up, your kingpin will slide back into the jaws. You can see, once they get back far enough, it'll automatically, both jaws will interlock and go around it completely. You notice the handle goes back into the closed position. The holes line up. You can take your pin and clip, drop it right through there. Clip it. You're all ready to go, ready to tow.Now, if you want to move the slider, like right now it's in the towing position, which means the kingpin is close to the cab as could be. So you get into your camp ground and you need to make some sharp turns, you want to get that extra 12" of clearance, so your 5th wheel doesn't hit your truck, what you'll do is take this slider handle, pull it out. Then just twist it away from where you're going to go. In other words, it says towing position here, maneuvering position here. So we pull it out and we twist it that way. Then when you move, it will automatically slide. You can see, once it gets to the maneuvering position, the 12" you've gained, it will automatically lock it into place, and you're ready to make your tight turns.Then, when you're done camping, you want to get back on the road, you want to move this into the towing position. Again, just pull this handle out, twist it the opposite way of which way it's going. You'll notice as it moves, it'll slide back to the towing position and lock right into place. 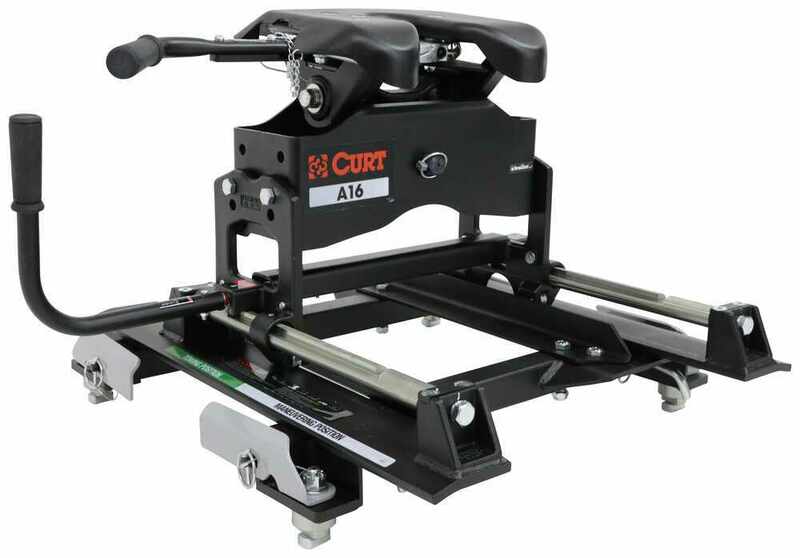 Simple as that.That should do it for the review on the Curt A16 5th Wheel Trailer Hitch, on this R16 slider, for the Chevy/GMC Towing Prep Package, with a 16,000 pound weight capacity. 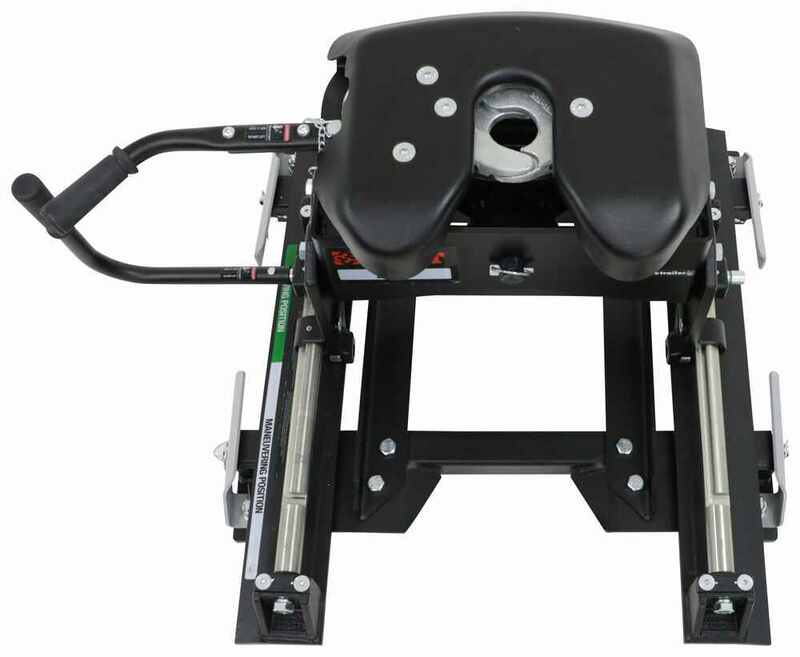 Order: RelevanceNewestRating - High to LowRating - Low to High Heavy-duty 5th-wheel hitch has interlocking jaws, a torsion head, and a color-coded lock indicator for security. Non-binding slider ensures proper clearance during slow turns. Includes adapter rails for Chevy/GMC 5th-wheel towing prep package. Still very happy with this setup. Have pulled our camper from South Georgia to the panhandle twice and as far north as Michigan since my first review. It works great and feels very secure when connected. Awesome. The hitch has worked great. Very, Very happy with the purchase,delivery, installation which I did myself, and performance of the product.Thanks again,Ill be sure to refer anyone who needs products you offer to you. The Curt Hitch is awesome! This hitch has made towing enjoyable. No more chucking when I am crossing bridges or hit dips. I have had this hitch about one year now and over 5,000 miles towing. Love the hitch. It is very easy to hook up and quite when towing. So much better than the Reese I had. After a year, I love this hitch. It’s easy to hook up and unhook unlike the auto slider hitch it replaced. Paint is still good. Silver stuff is still silver. Has a small patch on the head where the camper hitch slides on. Unit performs well. It is quiet during turns. I feel safe using it. I will buy a curt hitch again if ever I need a new one. The first one I bought had some internal problems and became very loose around the kingpin when towing. I talked to an Etrailer rep and he put me in touch with the Curt manufacturer directly who sent me a new hitch and had me send the old one back at no expense to me. I was very pleased with Etrailers and Curts customer service. They listened, understood, and solved the problem very quickly once it was identified. Thank you, and I WILL look to you for my further trailer needs. Thanks for the follow up Robin, I did want to let you know that Curt recommends using a high pressure wheel bearing grease like the ones that I have linked. The products have worked flawlessly no problems and thank you for checking back with me its nice when a company cares about there costumers. Next time I need any trailer products I will definitely be contacting etrailer. Could not be happier with this hitch. Have never had any coupling or uncoupling problems even in odd angle situations. Does not rattle or let the trailer chuck around. Easy to move. In and out of the truck. The powder coating is fading and showing some signs of surface rust but this is most likely due to it living in the truck unprotected. I have since moved the hitch into a 2017 ram 2500 with the puck system. I bought the puck mount and every thing bolted up nicely. I keep the standard rail legs under the bed of the fifth wheel should I ever need to pull with a truck that doesn’t have pucks. This has happened once when our truck broke down. Would definitely recommend this hitch. We're glad to hear you're happy with your purchase! A light coat of a quality car wax will help protect the finish from the elements. The GM factory fifth wheel rail kits are slightly different between the short and long bed trucks so the hitches we offer for the GM factory rail kits are bed length specific. So the Curt A16 part # C16520-16025 will only fit the long bed trucks. 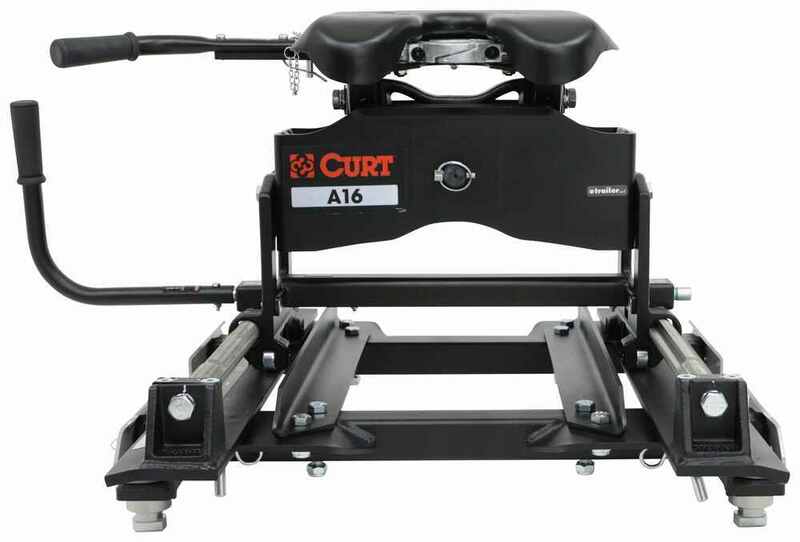 Since you have a short bed truck you'd have to go with a slider Curt hitch like # C16668.